Both sides intensify their get-out-the-vote efforts in an election expected to have low turnout. BOSTON – Republican Gabriel Gomez and Democrat Edward Markey cranked up their get-out-the-vote efforts Monday, knocking on doors, calling voters and holding rallies across the state in the final hours before Massachusetts’ special election for the U.S. Senate on Tuesday. The campaigns’ competing ground games are aimed at getting supporters to the polls in a contest where turnout is expected to be light, a contrast to the high-profile special election in the state three years ago. 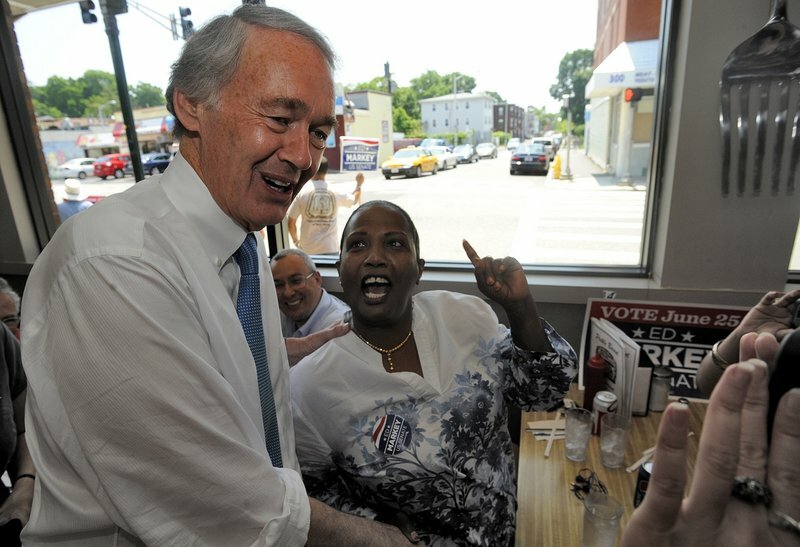 Markey, a longtime congressman who’s led in polls ahead of the election, swept through the state Monday, greeting supporters in Springfield and Worcester and participating in a business tour of downtown Lawrence before heading to a rally in his hometown of Malden. 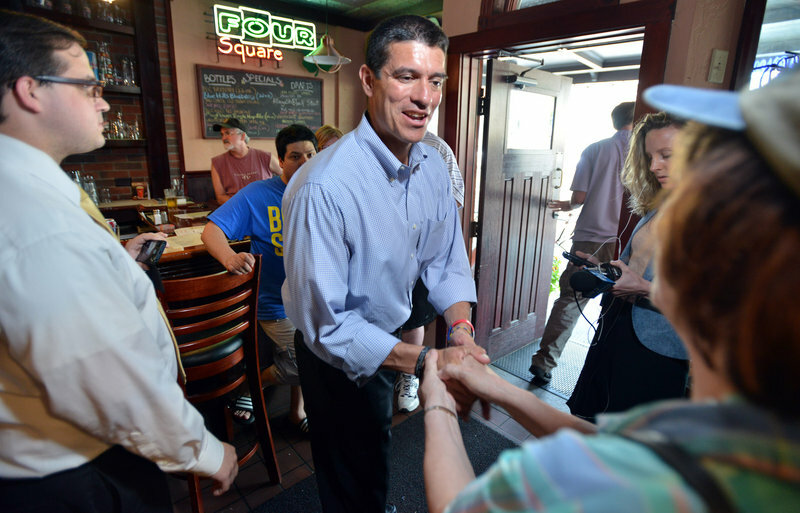 Gomez, a businessman and former Navy SEAL who’s a political newcomer, focused his attention on southeastern Massachusetts. Earlier in the day, Gomez greeted commuters at a Braintree public transit stop before heading to Plymouth, Hyannis and Brockton. He was scheduled to hold an election eve rally with former U.S. Sen. Scott Brown in Quincy. All indications pointed to what the state’s top elections official termed a “very weak” turnout at the polls, thanks in part to the timing of the election and a lack of deep interest in it. “There just hasn’t been the intensity in this race,” said Massachusetts Secretary of State William Galvin, who projected that no more than 1.6 million of the state’s 4.3 million registered voters — about 37 percent — would participate in the special election. By contrast, about 2.25 million voters cast ballots in the 2010 special election to succeed the late Sen. Edward Kennedy. Brown, a Republican, won that race. Galvin, a Democrat, said none of the political dynamics in that race appear to have taken shape in this election. “I’m not going to deliver a political analysis, but it’s obvious that some of the factors that were present in 2010 … the national interest, the effects on the workings of the United States Senate, are simply not present this time,” said Galvin. The date of the election, coming when many people are beginning summer vacation, could be a factor in keeping turnout low, he said. Temperatures were expected to soar into the 90s in parts of the state Tuesday. Both campaigns are keenly aware of the importance of turning out their voters. “Some of the pollsters and the pundits would like to say, ‘Oh, it’s an easy victory, Ed’s got it won.’ We as Democrats know we cannot trust that,” Middlesex County Sheriff Peter Koutoujian said at a Markey campaign stop Sunday in Framingham. “We learned a couple of years ago the hard way that if we don’t do our job someone will take advantage and they did,” he said, referring to Brown’s win. Gomez supporters are equally aware of the need to get their voters to the polls. “You can in a sense, without engaging in voter fraud, have the power of really three votes for the people that are sitting this one out,” Hedlund said. Gomez said voters are ready for a change. “He’s, like, twice as old as you are,” Gomez said of the 66-year-old Markey while talking to an undecided voter, 18-year-old Vaughn Haynes, of Holbrook. Gomez is 47. Hayes, who said he voted for President Obama in the fall, later said he would likely vote for Gomez. “He’s the only one I’ve met,” Haynes said. Markey also urged his supporters to dig in for the final push. “This is what the first five months have been all about,” he told backers Sunday. Tuesday’s special election will fill the seat formerly held by John Kerry, who resigned from the Senate to become U.S. secretary of state.